Marie Kondo is right. Before you can declutter, you need to shift your mindset. Take a peek in your closet or basement and you’ll likely come across plenty of items that you haven’t used in years. The t-shirt from your high school musical, a dress you wore to a wedding five years ago (and will probably never fit into again), an old pair of roller blades you never use. The thing is, plenty of us have trouble tossing things — and there are two main reasons why. The biggest one is our need for safety, security and stability, says Dr. Frank Niles, PhD, social scientist and life and business strategist. This could very well explain why you can’t part with the panini maker you bought 11 years ago, even though it’s barely seen the light of day. “You may think, ‘I’ve used this tool one time and I may never use it again — but what if I need it in the future? I want to be able to have that thing at that time to address that need,’” says Niles. Reminiscing about the past makes us feel good: It can lead to increased feelings of social connectedness and elicit positive emotions. To avoid becoming overwhelmed while you’re de-cluttering, work in three- to five-hour increments. Jessie Freschl, stylist, personal shopper and closet consultant in New York City, is a big fan of Marie Kondo’s “The Life-Changing Magic of Tidying Up: The Japanese Art of Decluttering and Organizing.” Kondo’s method is based on a simple premise: If something doesn’t make you happy, or “spark joy,” you should get rid of it. That’s why Freschl recommends touching objects and seeing what emotions they evoke to help you figure out if they’re worth saving. For example, if you pick up a dress and remember how itchy the material was and how uncomfortable it made you feel to wear it, then it’s time to say goodbye, says Freschl. If something has sentimental value to you (but you know you’re not going to use it), snap a pic of it, then toss it, says Niles. To avoid becoming overwhelmed while you’re de-cluttering, work in three to five hour increments, says Freschl. “If you’re spending more than that, you’re going to drain yourself,” she says. Niles suggests focusing on one room or one area at a time. De-cluttering isn’t a one-time activity, though. “People often don’t take time to maintain it, and then it becomes this vicious cycle of not cleaning out your closet and de-cluttering,” says Freschl. “You’re left feeling so overwhelmed with nowhere to go — it’s almost easier to keep shoving things in your closet than just dealing with it.” Freschl even had one client who held onto things for 20 years (and had two rooms in her apartment full of clothes to boot!). Shift your mindset. Reorient yourself to the present and recognize if you're holding on to something because of nostalgia for the past or stability in the future. Prioritize the things you really need by asking yourself: Is this item adding value to my life? Avoid getting overwhelmed by working in three to five hour increments, and focusing on one room at a time. Think seasonally. Clean out your closet two to three times a year (from summer into fall/winter, spring into summer and somewhere in between). Donate, don't trash. 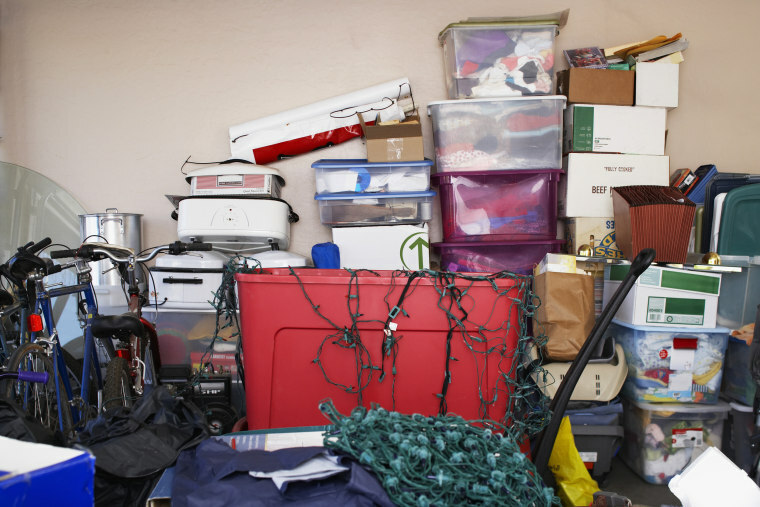 It'll be much more satisfying (and less painful) to pay it forward by donating your clutter.